Having grown up in the Pacific Northwest as a teenager, I was drawn to the evolving music scene in Seattle. By the early 90’s a tight community of local bands played numerous venues and local shows, each band with a similar yet distinctive sound. These local Seattle bands were eager and ambitious, supporting one another to put on great local shows. I was privileged to have some of these local Seattle bands on my radio show and became good friends with several of them. Without a doubt, the energy and excitement at the local shows was not only from the bands themselves, but from the fans as well. An emphasis of these shows was to highlight many local and unique talents. Through this venture, local bands such as Alice In Chains, Mother Love Bone, Nirvana, the Melvins and Soundgarden employed a “Tweener”. These “Tweeners” were local acoustic guitarists, bongo drummers and street performers who would play between the bands when they were changing their sets, stage equipment and instruments. 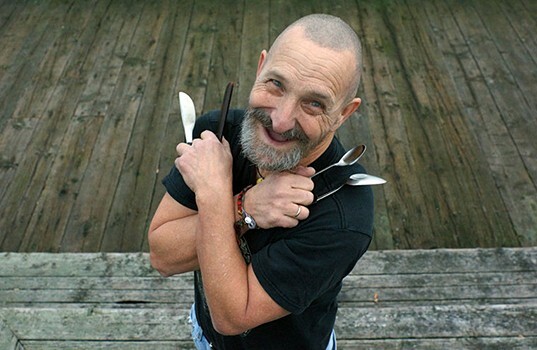 One specific street performer drew a large following for his kind demeanor and unique instrument of choice: spoons. Traveling back to the Pacific Northwest in the early 90’s, Artis began making appearances at local music festivals, as well as a street performer at the popular Pike Place Market. With his collection of instruments: flute, recorder, and various spoons of different shapes and sizes, Artis was a mini-celebrity and local legend. Becoming a “tweener” for Seattle shows, Artis caught the eye of an up-and-coming local band, Soundgarden, in 1992 at a Seattle music festival. Artis sat quiet for a moment, reflecting about his time with Soundgarden. He turned his head in a proud realization, “I still have that session [recording]” he proclaimed with a smile. We decided to head to his recording studio across the street. Typical Pacific Northwest rain with a coastal breeze welcomed us to his studio. Cardboard boxes and black music crates along with scattered memorabilia were laid about the one room studio. Artis settled himself in front of his computer. Monitors, a keyboard, a VHS/DVD player were decorated with stickers from music festivals, old photos and various spoons strewn about his make-shift studio.